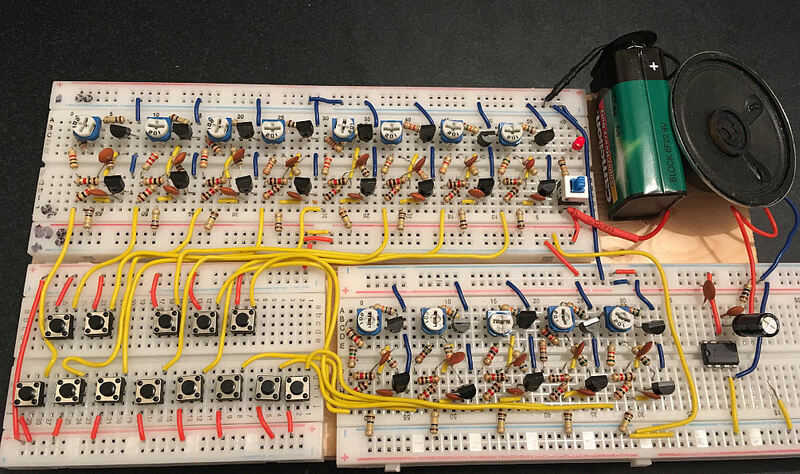 [SOLVED] Why does music synthesizer built from chain of astable multivibrator circuits get &quot;out-of-tune&quot; after a few hours? 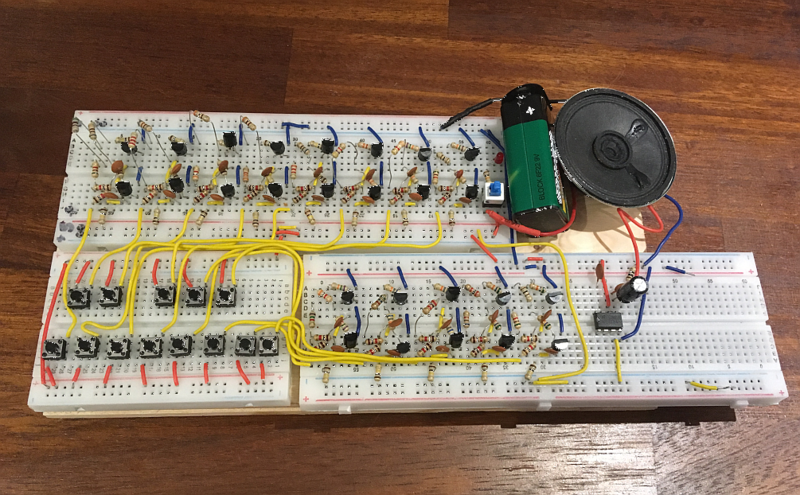 [SOLVED] Why does music synthesizer built from chain of astable multivibrator circuits get "out-of-tune" after a few hours? This doesn't really address the question. While it is in fact correct that a 16 MHz clock source with minimal drift, combined with a digital system, prevents this issue, it does not discuss why this detuning occurs in the analog system detailed in the question. Very cool demo! The polyphonic capability is neat. And the tones sound very nice compared to the basic square waves in the above. What kind of filtering did you use? Basically none. Outputs go thru 1uF cap to make them +/- 2.5V, then thru a resistor for the analog mixing. If you search "piano tones micros" in the Arduino forum, the topic will pop up, and there is a schematic there. I cannot access the site from where I'm at, or I'd post it here. I am somewhat surprised that digital designs have not risen to the occasion. I would agree there is a difference (symmetry and exact proportions are not always good and could generate unpleasant beats) but it’s something that can be addressed by pseudorandom sequence generators, spread-spectrum oscillators, and PLLs. I suspect a good degree of snobbery is involved. @EdgarBrown If you can make a digital system that sounds as good as the analog ones, people will pay through the nose for it. So far the best digital recreation of analog I've heard is the Kemper Profiler amplifier products. To be fair, there are many live situations where digital modeling is used extensively or exclusively. In a live show, it's hard to hear the top 5% - 10% of quality, so reliability and flexibility wins out. But when you really want to have the sound, there's almost always only one way to get it. @EdgarBrown Also interesting how people are often less surprised that we can't recreate Stradivarius violins or vintage Martin guitars with modern technology, but are more surprised that we can't recreate a 1974 Minimoog or a CS-80. I don't really know why there's a difference in perception there. DSP isn't analog in the same way that modern American maple trees are not 17th century Italian maple trees. Not a synth exactly, but the Mellotron is another interesting example of this. It operated by playing back long spools of tape, each one note recorded from an instrument (such as a flute), and pressing multiple keys could create enough of a load on the motor to slow it down and detune the notes. Attempts to tune it were often difficult, and Robert Fripp even said "Tuning a mellotron doesn't." @ToddWilcox in the end, it comes down to "which exact serial number of Minimoog do you want to recreate accurately." Analog instruments like these all sound different from each other, if your ears are good enough and you care about such things. But then, you can recognize individual Strad violins from their different sounds, as well! @ToddWilcox - fascinating about the pure analog designs and how each approached the need for tuning. Ok, so I will put the tuning pots back in for now, and think about how to make that slicker (tuning the 13 oscillators individually takes a few minutes, but requires multiple passes, and is not a great user experience). Thanks for sharing the details! @ToddWilcox You might be interested in the efforts taken to capture the sound of a Stradivarius. From what I can tell from the article, their goal is to eventually build a digital model of these violins. In the mean times, the requirements on recording that are so strict, that an entire town stayed quiet for a month because the incredible microphones they needed could pick things up from a long ways away, and a glass breaking in a nearby building could ruin a recording. On the topic of Stradivarius violins, there have been blind tests and the superiority is not as obvious then: sciencemag.org/news/2017/05/… It's also kind of the case that if you buy very expensive gear expecting some kind of improvement, chances are you will hear it, whether it's really there or not, because of various cognitive biases. You should use the actual real frequency values (698.456 Hz instead of 698 Hz for F5) to compute the % error. But your % error values are wrong by the factor of 100 anyway, 0.0644 % instead of 0.0008 % for F5. I used a different chart now. Hope you are happy. Looks better now, but I would prefer to write 698.46 instead of 698.4600 when you use values with two digits after the decimal point. Feel free to post your own answer. Just love point 7 ! @kebs If you think point 7 is a joke, I guess you never used a fully analogue synth, back in the day - not even a professionally designed one. @MichaelKaras your "correct" frequencies are only correct to two decimal places. Of course that is more than good enough for tuning the notes, but it has a big effect on your percentage error calculations. It doesn't change the overall story you are telling in the post, though. 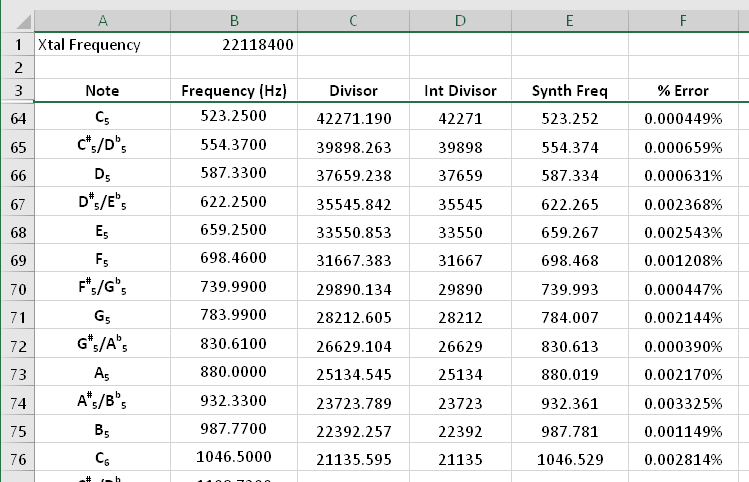 @alephzero - I will have to disagree with you on how much the % error calculations vary between using two decimal place note frequency numbers versus using three decimal place note frequency numbers. Over a full 9 octaves of notes the maximum delta between the %Error numbers are +/-0.0012. These occur at G#4/Ab4 and A#4/Bb4. If you want to see the full spreadsheet send me your email address. You can thread through my profile to figure out how to send it to me. Point 7 reminds me of an anecdote years ago that made the rounds among scientists and engineers, about a family. After dinner the dad would run out for ice cream. When got chocolate, he drove home fine. If he got vanilla, his car wouldn't start for the trip home. Explanation was mundane but non-obvious. So I wouldn't be surprised if the Moon had caused trouble in electronics. One factor that's easy to overlook is air motion. A slight breeze a human might ignore could be cooling the electronics ever so slightly. Only a slight change is needed to make musical notes sound off-pitch. [SOLVED] Using CD4093 as Schmitt trigger oscillator. How to measure high and low trigger thresholds? [SOLVED] Why cannot circuits like astable multivibrator, RC phase shift oscillator and wien bridge oscillators be used as inverters?